Lady and the Blog → Personal Blog → Daily Diary: How Low Can I Go? Daily Diary: How Low Can I Go? I have a doctor’s appointment this morning. Shocking! It’s Thursday – there’s always a party on Thursday! 🙂 But last night, hubby and I were talking about the belly and whether or not it looked like it dropped. Of course, I’m delusional and am insisting that it has… but Bill doesn’t think so. He says I’m still very high. My brain sees that I haven’t really dropped… but the rest of me is in DENIAL. Maybe a little? Sort of? Slightly? Come on! Men turn away for this next statement — my mucus plug hasn’t released yet. So I know that I am no where near being ready to go, but I’m 36 weeks tomorrow so it could be ANY DAY NOW. By this time next week, I was holding Natalie in my arms. This is it! The countdown has begun. I keep telling the kids – we could have the baby tonight or in 2 weeks. We really don’t know! Then of course there is THIS to worry about. 25 inches on Long Island? REALLY? The good news is that every single news station is saying something different. So, this is an extreme. I’ve heard only 6 inches on Saturday too. WHO KNOWS! 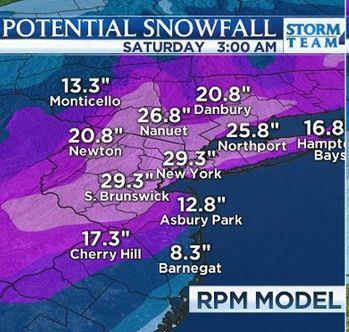 The forecast I heard earlier was “somewhere between 3 and 36 inches.” Way to narrow it down! Hope you are feeling good! You look great, Vera. I’m no expert, but it still looks high to me. No one knows our bodies like we do, so I bet you have dropped a bit & it’s not noticeable to everyone. How far along is Audrey?